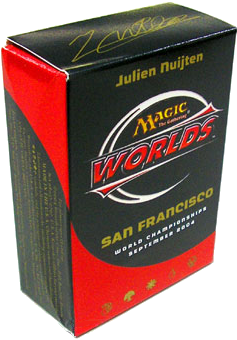 As descendants of the Pro Tour decks, the World Championships decks are a series of high profile preconstructed decks for experienced players. 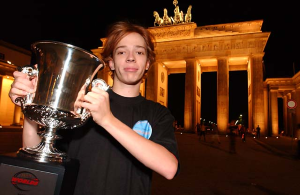 Imitating the four most successful deck archetypes present at the annual World Championships, four new decks are released each year. All cards of these decks feature a golden border, a signature of the appropriate player, and a special backside and are therefore not tournament-legal. 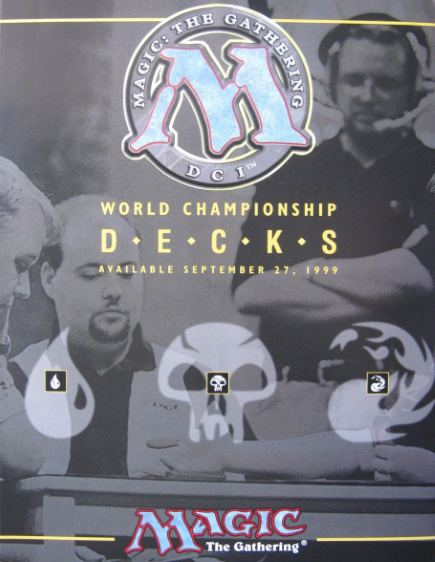 The decks are sold individually, but all decks of the same year share the same front. 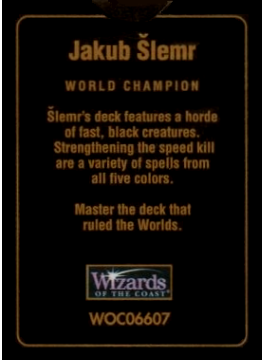 Part of each deck is a bio card which provides some background of each player, a deck list card which lists the content of each deck, and a deck overview card which explains in short the core strategy of each deck released in the same year. 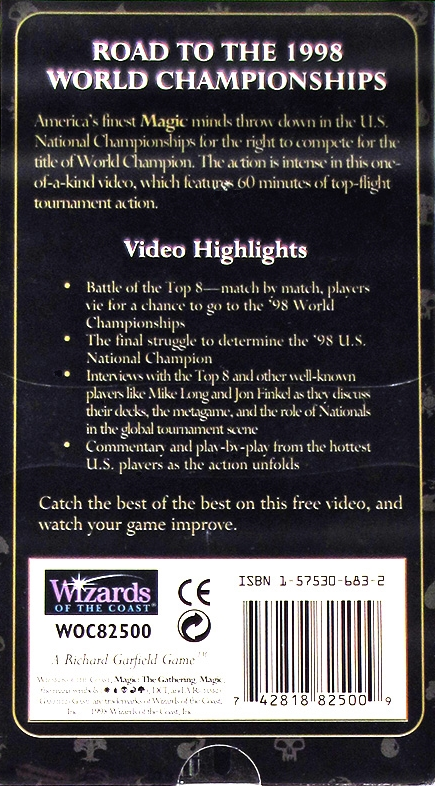 Additionally, 12 blank cards are added to raise the number of cards per deck to 90. Usually all blank cards are identical in each deck. 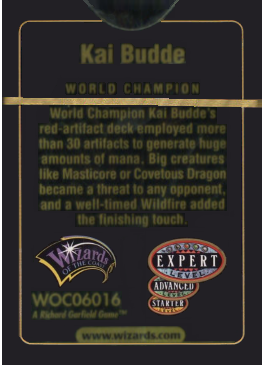 However, in case of the 1999 World Championships deck by Kai Budde, a single blank card with bevelled edges was inserted, while all other 11 blank cards of that specific deck have plain edges. 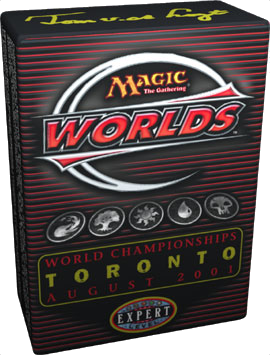 For the 1998 World Championships, each individual decks were sold also bundled with a 60 minutes VHS video named "Road to the 1998 World Championships" (WOC82500) released in 1998 with an original retail price of $11.95. All cards in the 2003 and 2004 World Championships were printed using the modern card frame, despite many cards included in these decks never having been printed using the modern frame before. 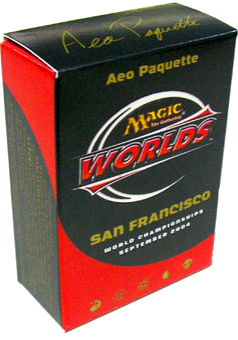 2004 San Francisco was the last World Championships Decks released by Wizards of the Coast. 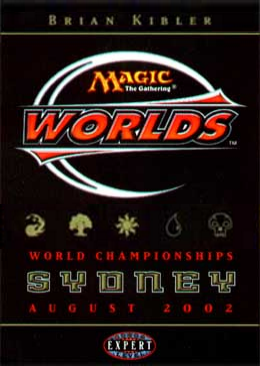 Q: "When are the 2005 World Championship decks scheduled to be released, and which decks will they be?" "We currently have no plans to release the 2005 World Championship decks. 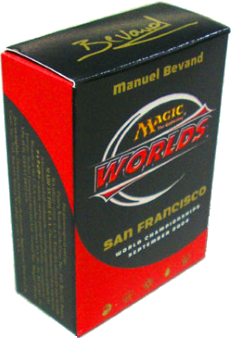 We try to have a full product offering for our fans, and the increased popularity of the Fat Pack seems to have gobbled up the demand for a fourth Magic product (after Boosters, Tournament Packs, and Theme Decks). 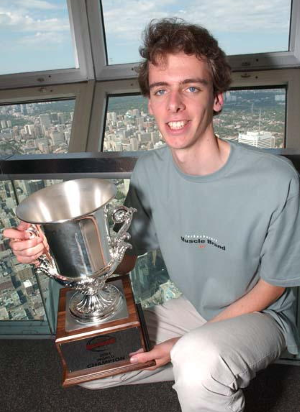 Sorry, Paul. 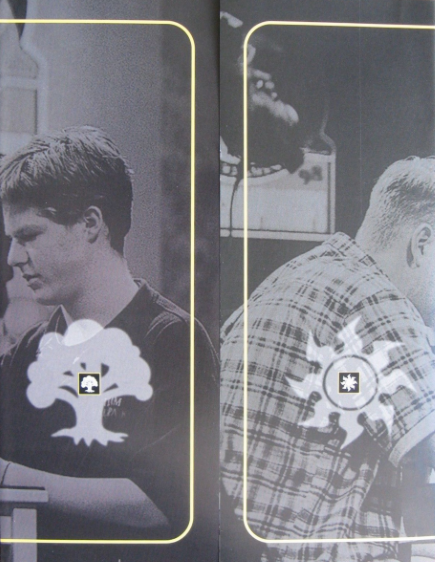 1998 Brian Selden's City of Brass: Missing the Arabian Night Symbols. 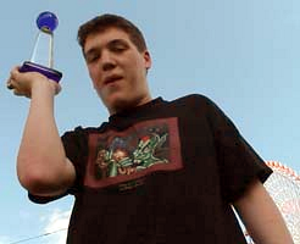 1998 Brian Selden Deck List: Lobotomy Visions instead of Tempest. 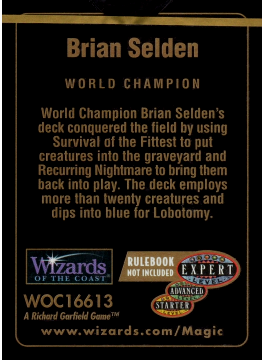 1998 Brian Selden Deck List: Orcish Settler instead of Orcish Settlers. 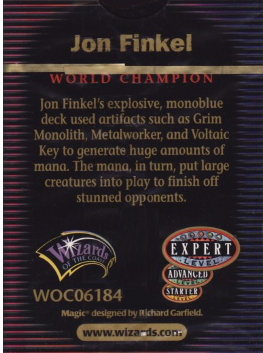 2000 John Finkel Deck List: Island only from Classic Edition (no Urza's Saga and Mercadian Masques). 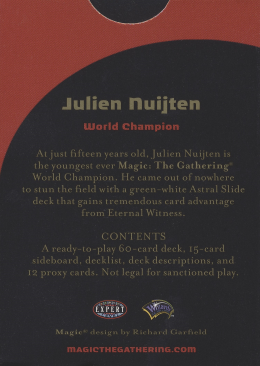 2000 Janosch Kühn Deck List: Forest and Mountain only from Classic Edition (no Urza's Saga and Mercadian Masques). 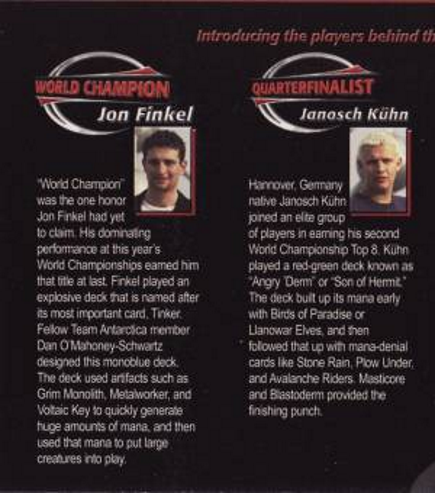 2000 Janosch Kühn Deck List: Stone Rain only from Classic Edition (no Mercadian Masques). 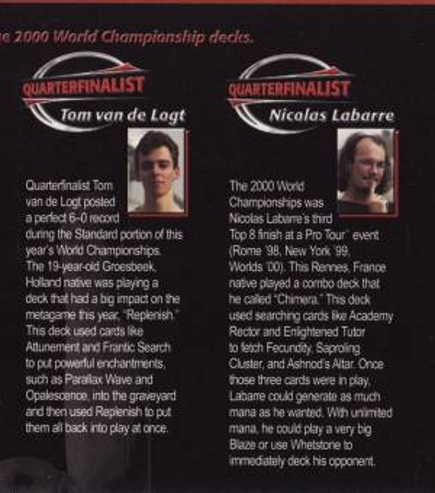 2000 Nicolas Labarre Deck List: Forest only from Classic Edition (no Urza's Saga and Mercadian Masques). 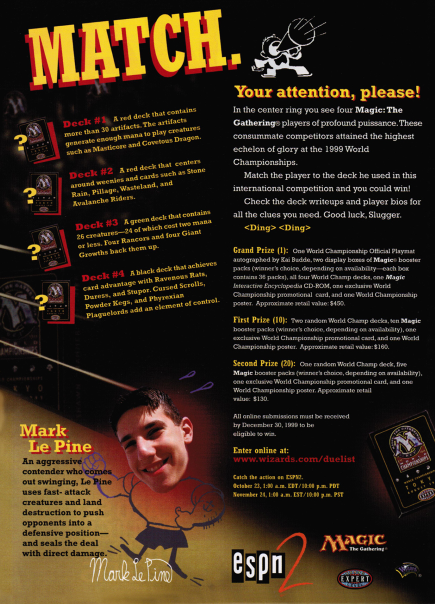 2000 Tom van de Logt Deck List: Island and Plains only from Classic Edition (no Urza's Saga and Mercadian Masques). 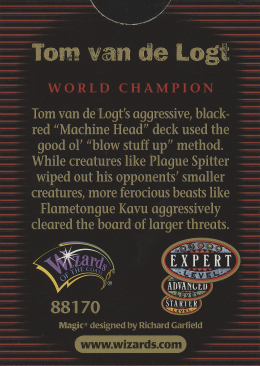 2000 Tom van de Logt Deck List: Counterspell only from Classic Edition (no Mercadian Masques). 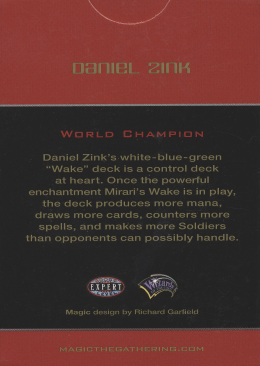 2001 Jan Tomcani deck: White shading on first white mana symbol missing. 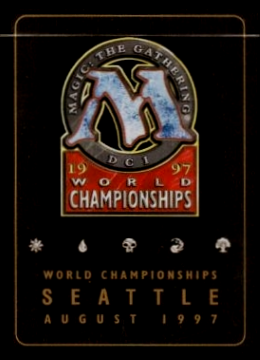 1997 WORLD CHAMPIONSHIPS, SEATTLE, WASHINGTON, U.S.A. 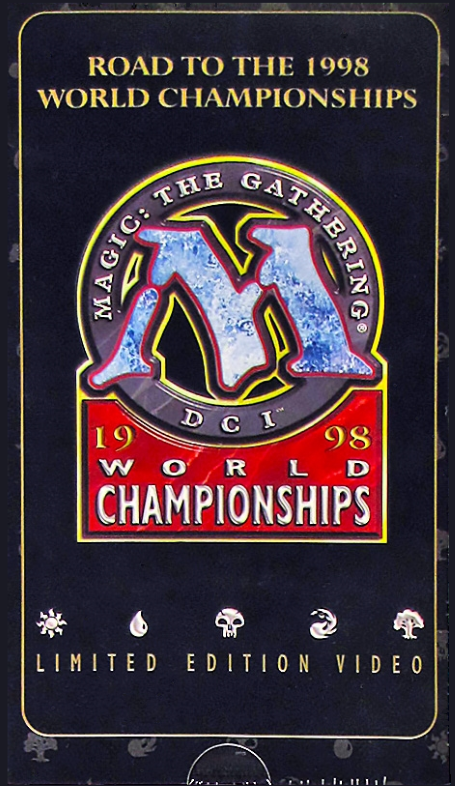 The 1997 World Championships took place on August 13-17, 1997 in Seattle, Washington in the United States of America. 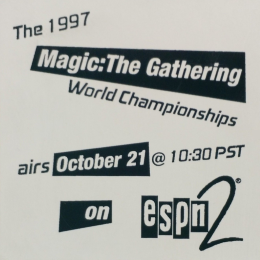 It was the first Magic tournament to be filmed by ESPN2. 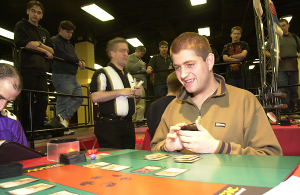 The tournament featured Standard, Mirage, Visions, Weatherlight Rochester Draft, and Extended. 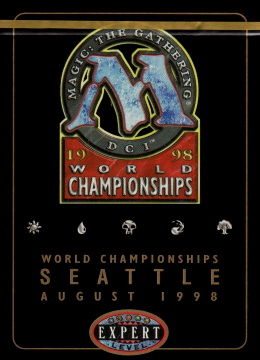 1998 WORLD CHAMPIONSHIPS, SEATTLE, WASHINGTON, U.S.A. The 1998 World Championships took place on August 12-16, 1998 in Seattle, Washington in the United States of America. 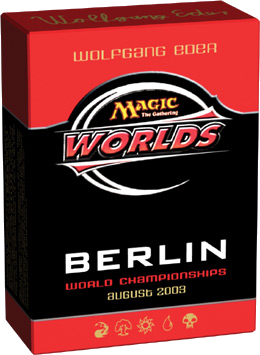 The tournament featured a Standard Tempest, Stronghold, Exodus Booster Draft and Tempest Block Constructed. 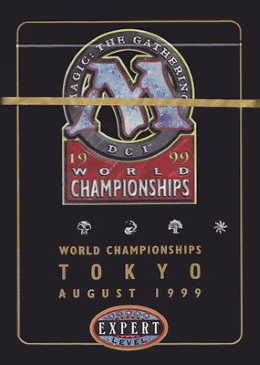 The 1999 World Championships took place on August 4-8, 1999 in Yokohama, Japan. 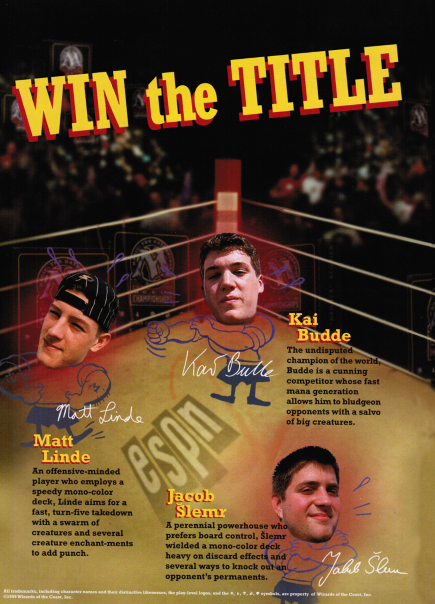 The tournament featured an Urza's Saga, Urza's Legacy, Urza's Destiny Rochester Draft, Standard, and Extended. 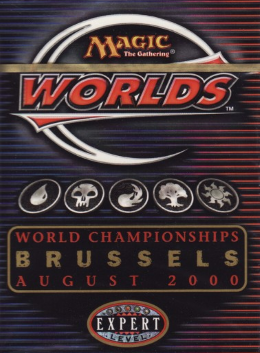 The 2000 World Championships took place on August 2-6, 2000 in Brussels, Belgium. The tournament featured a Mercadian Masques, Nemesis, Prophecy Booster Draft, Mercadian Masques Block Constructed, and Standard. The 2001 World Championships took place on August 8-12, 2001 in Toronto, Canada. 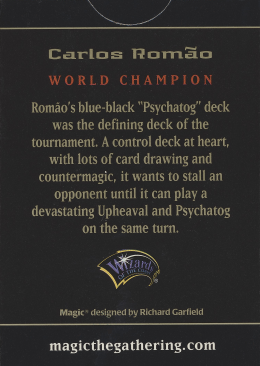 The tournament featured Invasion, Planeshift, Apocalypse Rochester Draft, Standard, and Extended. 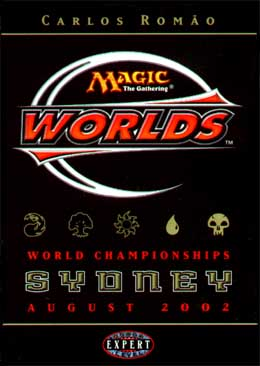 The 2002 World Championships took place on August 14-18, 2002 in Sydney, Australia. The tournament featured Odyssey, Torment, Judgment Booster Draft, Odyssey Block Constructed, and Standard. The 2003 World Championships took place on August 6-10, 2003 in Berlin, Germany. 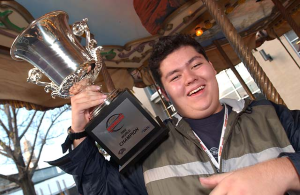 The tournament featured Onslaught, Legions, Scourge Rochester Draft, Extended, and Standard. 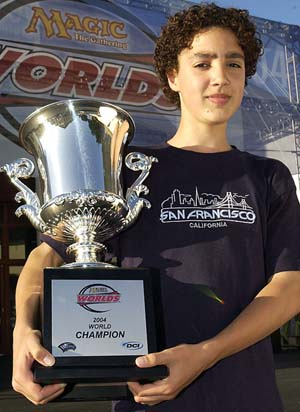 2004 WORLD CHAMPIONSHIPS, SAN FRANCISCO, CALIFORNIA, U.S.A. The 2004 World Championships took place on September 1-5, 2004 in San Francisco, California in the United States of America. 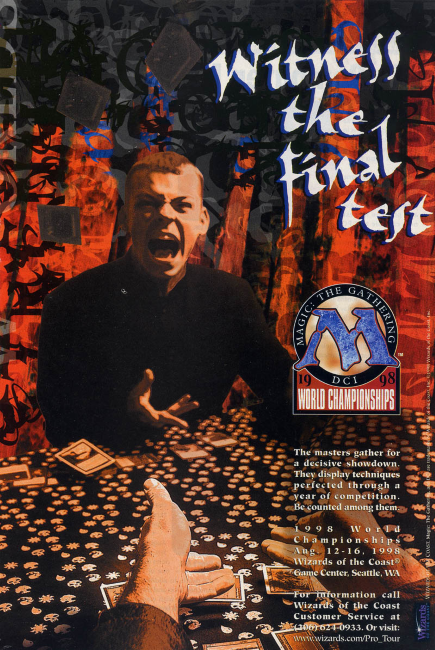 The tournament featured Standard on Wednesday, Mirrodin, Darksteel, Fifth Dawn Booster Draft on Thursday, and Mirrodin Block Constructed on Friday.